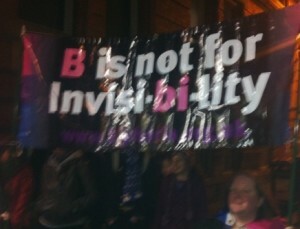 Manchester-based bi organisation BiPhoria is celebrating its 20th birthday – their first social / support evening for bisexual folk and those who think they might be bi was held on the 1st September 1994. It’s the UK’s longest-running bisexual group: there were others before it, but those have fallen by the wayside in the intervening decades. Manchester’s queer culture hasn’t always helped the group: the city council is proud of its progressive record on lesbian and gay rights in the 80s but had the non-existence of bisexuality as a matter of council policy in the 90s and 00s. At the time the group formed many bi groups were gendered – men’s or women’s bi spaces – but the early 90s was when the bi movement in the UK started to get to grips with gender diversity and building welcoming spaces regardless of gender identity. BiPhoria has been the cornerstone to work including bi social and support spaces, political activism (lobbying local and national government as well as highlighting biphobia on the local gay scene), and research publications on bi needs and mental health. Earlier this year the group led the Manchester LGBT demo about the Sochi winter Olympics for half of the march, alternating with the Lesbian & Gay Foundation. Tomorrow, BiPhoria will celebrate its 20th anniversary meeting. We expect there will be cake. Happy birthday BiPhoria. Give ’em a birthday retweet on Twitter here. Meet bis in Manchester, Southampton, Edinburgh, Cardiff, Brighton and London!